CNMG OTHER EDGE BORING BARS :: ToolingBazaar.com - Buy CNC tools and accessories online. 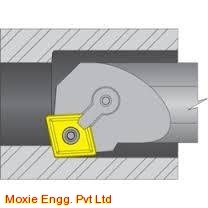 CNMG Other edge boring boring bars are used for using remaining edges of CNMG inserts. By using these bars one can use 8 cutting edges of these inserts. Best economics can be achieved with these bars. Bars available from Dia 20mm to 40mm.